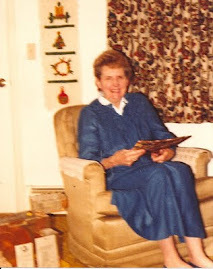 Grammy Gertie's Recipe Box: Happy Birthday, Grammy Gertie! "I’m just an old farm girl at heart." It's time to celebrate another birthday! We're going to continue on with more of the interview today. Be sure to wish Grammy Gertie a Happy Birthday when you see or talk with her! "When I was younger, my mother was a very good piano player. At that time they didn’t have sound in the theaters, so my mother played the piano. The people who played the piano would play fast when it was an exciting part, or use it to speak the parts of the movie, or something like that. She played the piano for quite a few years until sound started to come into the theaters. And then of course she taught me how to play the piano. I know; no one’s heard me play. I was about 8 years old, and from there on she taught me and a few other people too. I kept on playing and when I was in high school I played for the high school glee clubs and the orchestra. I played for both the boys and girls glee clubs. The band was about half girls and half boys. I think there was about 125 in our orchestra. It was a good sized band. At that time the music director said to me, "Why don’t you get interested in the percussion instruments?" He started me out with bells and chimes, snare drums, and all those. Then my folks bought me a marimba. It looked like a xylophone. It depends which hammers you use – you can make it sound like a xylophone or softer, which is like a marimba. And so I played that for quite a while. Lots of groups like the PTA would ask me to come in as a guest and play for them. Either the marimba, or with the hard hammers to make it sound like a xylophone. I also learned to play the timpani, the kettle drums. They call them timpani or kettle drums. They’re the big drums you see in the back at the orchestra. I played those all the time in high school and the first couple of years after that. The music director had me come back and help him out as something special. I kept trying music. My folks kept encouraging – more my mother with that. When I was playing marimba, my father had a truck at the time and we could take the marimba in that and take me around to different places to play it. Otherwise it would have been very hard to get around. There were quite a few meetings that asked me to come and play. My father would arrange things where the whole family of us could go out and put on musicals. There were a couple of brothers that played the accordions. And (Grammy's friend/ sister-in-law) Janet tap danced – she was pretty good at tap dancing. She would go with us and we would put on little shows to attract people in the farm areas and the general stores. That would bring the people in to have a little bit of excitement that they don’t normally have." My sister just pointed me at this blog and I love it! Gertie is my mother's aunt and I love her cooking, it's so great that you've saved all of her recipes. It's like being back at her house for Thanksgiving dinner all over again! I'm Meredith's sister so Aunt Gertie is also my mother's aunt. My mom told me stories of Oma (Janet) wearing a rubber dress and Gertie playing the marimbas outside a tire shop. Do you know if this is true or any details on that story? Hello too!! Hannah and Meredith are my cousins- and Aunt Gertie is also my great-Aunt, although I grew up out west and so the last time I saw her I was something like 6 years old. I remember Oma tap dancing in the kitchen, but she never mentioned that Aunt Gertie played the Marimba!!! (I'm also a musician!) That is just so cool- and I LOVE that you're cataloging the recipe box! I'm going to have to convert some of these to gluten-free and post them on my blog! Thank you for preserving this little gem of family history! Cheers!